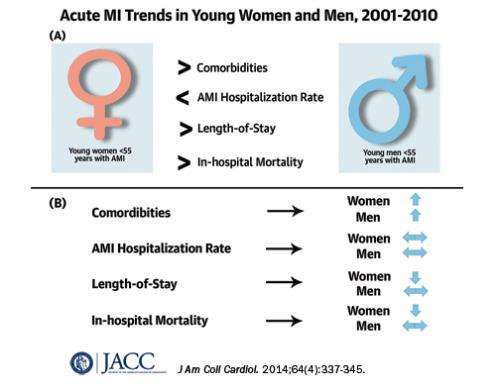 While awareness campaigns may be getting women to go to the hospital more quickly during a heart-attack, a new look at hospital data shows women have longer hospital stays and are more likely than men to die in the hospital after a heart attack. In the study published online today in the Journal of the American College of Cardiology, researchers from Yale School of Medicine analyzed 230,684 hospitalizations for heart attack in patients age 30 to 54 from a total of 1.1 million hospitalizations reported in a national database from 2001 to 2010. The study found that heart attack hospitalization rates for patients under age 55 have not declined as quickly as they have for Medicare-age patients, which have seen a 20 percent drop. "This trend suggests we need to raise awareness of the importance of controlling cardiovascular risk factors like diabetes, high blood pressure and smoking in younger patients," said lead author Aakriti Gupta, MD. All patient groups in the study saw increases in coexisting medical conditions including high blood pressure and diabetes. Men were more likely to have high cholesterol while women, especially black women, were more likely to also have hypertension, diabetes and heart failure. The authors concluded that younger women may benefit from more aggressive control of modifiable cardiovascular risk factors, including early identification and treatment of high blood pressure, high cholesterol, obesity, smoking, and diabetes. "Younger women are a vulnerable yet understudied group with worse cardiac risk profiles and worse outcomes after a heart attack as compared with younger men," Gupta said.